We are pleased to release the first report, “Climate Change in the American Christian Mind,” from our most recent national survey of global warming opinion. Many Americans draw, at least in part, upon their religious beliefs to guide their understanding and interpretation of climate change causes, impacts, and solutions. This report examines the global warming beliefs, risk perceptions, policy preferences, and related moral values of three major groups of American Christians – Catholics, non-evangelical Protestants, and evangelicals. It also investigates how these groups currently view Pope Francis and the extent to which he is considered a trusted voice on the issue of global warming. Nearly seven in ten Catholics (69%) think global warming is happening, which is a higher percentage than Americans as a whole (63%). 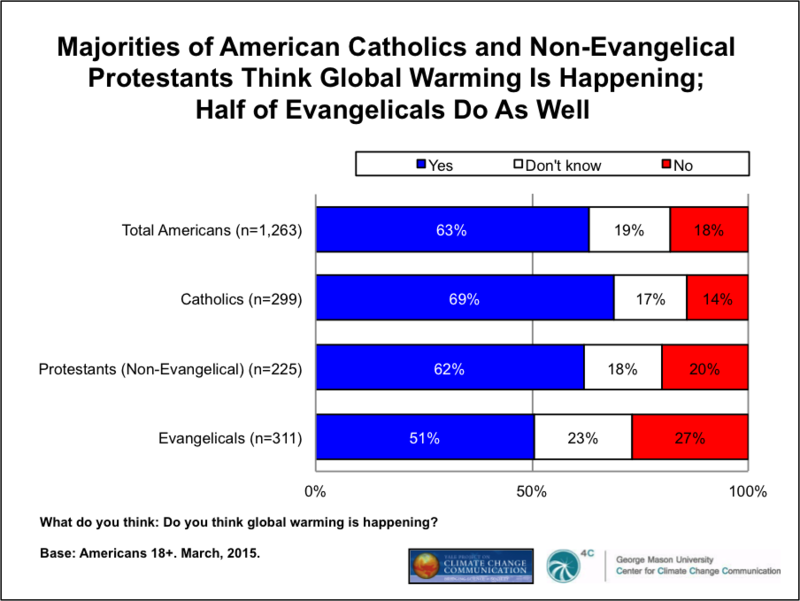 A majority of non-evangelical Protestants also think global warming is happening (62%). Evangelicals are split between those who think it is happening (51%) and those who think it’s not (27%) or don’t know (23%). 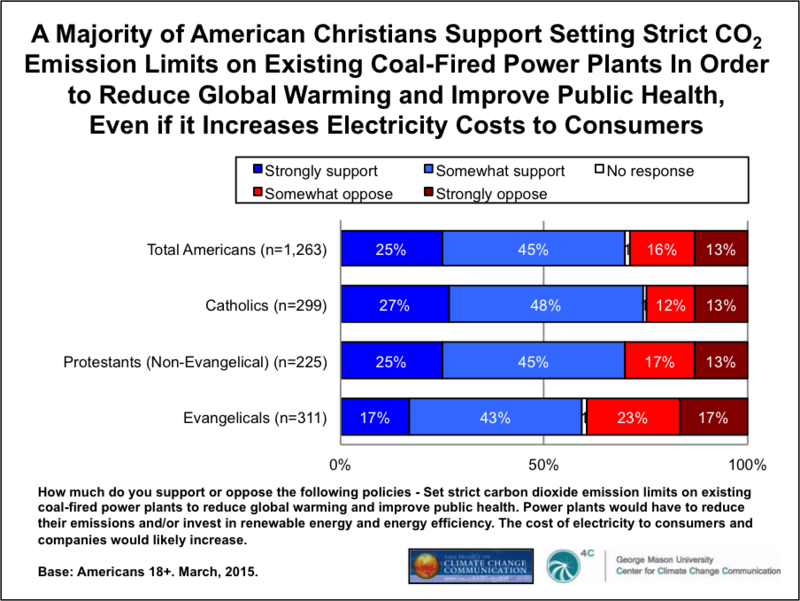 Majorities of American Christians support policies that would help reduce global warming, including tax rebates for people who purchase energy efficient vehicles or solar panels (83% of Catholics, 80% of non-evangelical Protestants, and 74% of evangelicals), more research funding for renewable energy (81%, 81% and 73%, respectively), and requiring electric utilities to produce at least 20% of their electricity from wind, solar, or other renewable energy sources, even if it costs the average household an extra $100 a year (67%, 68% and 60%, respectively). They also express strong support for strict carbon dioxide limits on coal-fired power plants – the essence of the EPA Clean Power Plan. The study also included a number of questions on underlying moral and religious values related to climate change and the environment. 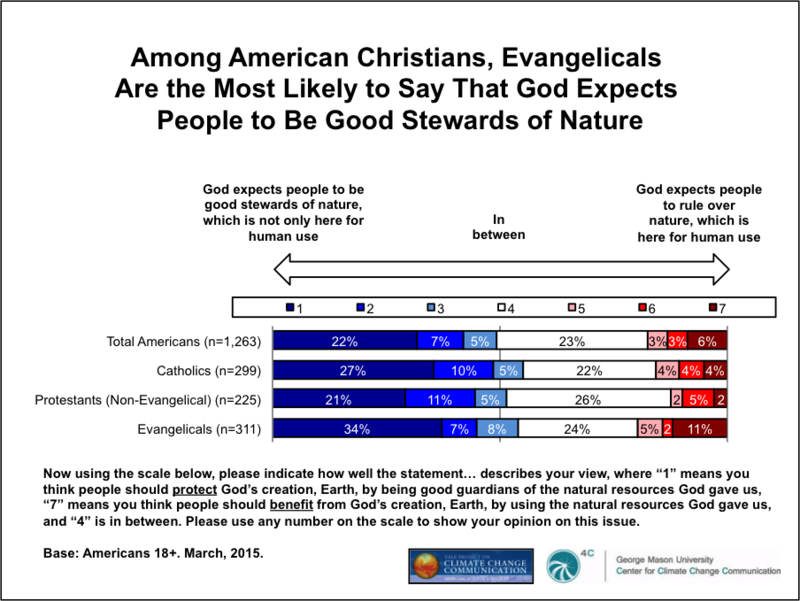 Most American Christians say the statement “God expects people to be good stewards of nature, which is not only here for human use” better reflects their views than the statement “God expects people to rule over nature, which is here for human use.” We also found that majorities of Catholics, Protestants, and evangelicals say it is important to them personally to care for future generations of people (82%, 82%, and 86% respectively), the natural environment (76% of each group), and the world’s poor (67%, 63%, and 77%), and that well over half of all Christians think reducing global warming will help future generations of people (67%, 60%, and 55%). The report includes many more fascinating results, including measures of other religious values, trust in different religious leaders as sources of information about global warming, and current awareness (which is very low) about the Pope’s forthcoming encyclical on climate change and the environment.